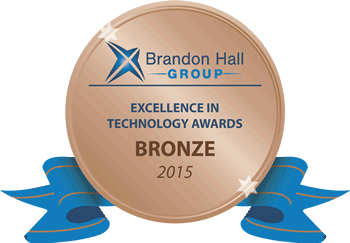 BONITA SPRINGS, FL – December 7, 2015 - Interactyx, the developer of the TOPYX® learning management system (LMS) software, is honored to win the 2015 Brandon Hall Group Excellence Awards in Technology bronze medal for the Best Advance in Learning Management Technology for Compliance Training. TOPYX LMS was launched in 2009 as a fully-hosted, social learning management system without user, data or implementation fees. TOPYX now has over 20 million potential global users from a diverse range of clients across all industries that include large multinational public and midsize private companies, nonprofits organizations, associations, governmental agencies and educational institutions. Clients choose TOPYX because of its ease of use, engaging peer-to-peer learning tools, outstanding value, robust feature set and dedicated support teams to provide compliance training, external portals, sales training, and other online learning management needs. A panel of veteran, independent senior industry experts, and Brandon Hall Group senior analysts and executives evaluated the entries based on product innovation, unique differentiators, value proposition and the measurable results attributable to the learning solution. The complete list of the award winners can be found at: http://www.brandonhall.com/excellenceawards/past-winners.html. “We are honored by this prestigious award from the Brandon Hall Group, recognizing the impact TOPYX LMS has for clients in need of online compliance training solutions, which is part of our standard offering," states Alfred R. Novas, Chief Executive Officer of Interactyx. “Brandon Hall Group has acknowledged TOPYX across several categories over the years, which truly reflects the broad range of TOPYX’s capabilities, as reflected by the diverse group of clients that choose TOPYX. With more than 10,000 clients globally and 20 years of delivering world class research and advisory services, Brandon Hall Group is the most well-known and established research organization in the performance improvement industry. We conduct research that drives performance, and provides strategic insights for executives and practitioners responsible for growth and business results. Brandon Hall Group has an extensive repository of thought leadership, research and expertise in Learning and Development, Talent Management, Leadership Development, Talent Acquisition and Human Resources. At the core of our offerings is a Membership Program that Empowers Excellence Through Content, Collaboration and Community. Our members have access to research that helps them make the right decisions about people, processes, and systems, combined with research-powered advisory services customized to their needs. Interactyx is an Inc. 5000 recognized company for two consecutive years.